Until 1953, the land on which the Hotel now stands was farmed for grapes and peaches by my grandparents Natale and Luisa Piotti, who lived with their parents and little Gabriella in the house in the background. Today the house still belongs to my mother Gabriella, and at least externally, is exactly as it was then. In 1953, Natale and Luisa built a small detached house in the middle of the vineyard to rent out during summer months. In 1957, at great personal sacrifice, the house was enlarged - in order to rent their house and scrape together the money for the building project, Natale, Luisa and Gabriella slept in a tent on the beach for two summers - and became the 12-room "Piotti Guesthouse." In those years, tourism in the Diano Marina area was not very particularly developed, and ingenious techniques were required to attract guests. Gabriella tells how, as a 14-year-old, she would stop cars with German license plates in the middle of the road, extolling the virtues of the family guesthouse! The division of labour was simple: Luisa was assigned to the kitchen, Gabriella handled reception, and Natale was responsible mainly for maintenance (in addition to hunting and fishing, his favourite "jobs"). In 1961, Gabriella married Franco Ghirardi, newly qualified as Merchant Captain from the Naval Academy at Leghorn. In the same year the guesthouse, which meantime had been constantly improved and enlarged, was renamed Hotel Gabriella. Franco decided not to take to the sea. His efforts, and in particular his keen, inquisitive mind and constant pursuit of innovation, enabled Hotel Gabriella to establish itself as an mportant attraction for tourists on the "Riviera dei Fiori." Without question, the changes to the hotel and the choices made by Franco had such a determining influence thanks also to the support and spirit of self-sacrifice of Gabriella and Luisa. Without the synergy of ideas and hours of long work little or nothing would have been accomplished. 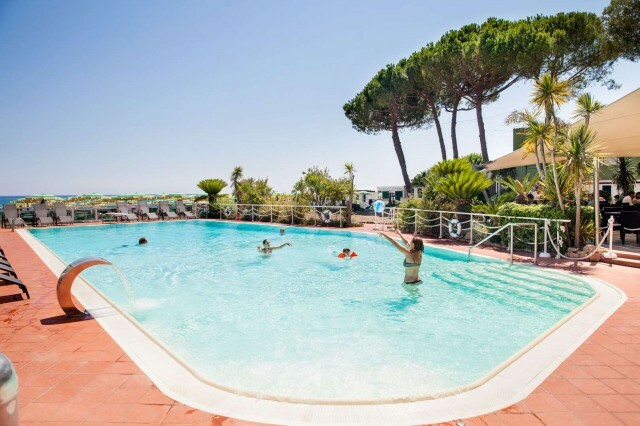 Thanks to an emphasis on customer care and a warm, family atmosphere, between 1961 and 1980 Hotel Gabriella built up an established base of loyal customers who returned year upon year to share holidays and adventures together. Many years on, some of them are still our welcome guests, such as Sannita, Alberto & Simo, Renzo & Maria Pia, Germana & Franco, Rosy & Tonino, Lillo & Wolfgang; all of whom certainly must remember dining in the gazebo, the bowls tournaments, the mid-summer dances, the bell announcing meals, the laughs and the dressing up in the dining room. Unfortunately, others are no longer with us, and in this chapter of our history we remember, with great affection and nostalgia for those summers spent together, the great Valentino with Uncle Vinicio, Renato, Virgilio and Compagnoni, the surly Polastri. Franco also passed away in 1989, much too soon and with much suffering…the period that followed was a very difficult time for us. Without my father, we - my mother, my sister Laura(who in the meantime had begun working with us) and myself - faced many challenges. Nonetheless, we are happy with the fruits of our labour, since the hotel continues to offer fresh proposals and improved facilities for guests with new ideas and services. And our regular, loyal customers, along with their children and grandchildren, continue to spend delightful holidays with us, never leaving without expressing their satisfaction. For that reason we like to define our hotel as "family-run for over 40 years, rewarded by a forty-year-long loyal clientele. Management characterized by courteous, attentive, helpful and discreet service. Managed by successive generations of our family for successive generations of guests."